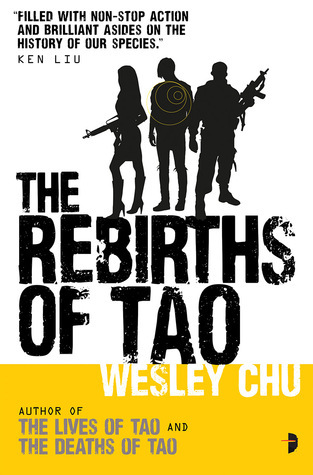 Just finished reading the Rebirths of Tao. This has been a great series with each book becoming successively better than the last – the ending is just brilliant! If you haven’t read the previous two books then stop reading now as there may be spoilers for the previous books. For a quick recap. Aliens landed on earth many many years ago. Unable to exist in the atmosphere they needed a host which they inhabit until the host dies and the alien is released and searches for a new host. During the course of their time on earth a couple of things have happened, some of the aliens have become attached to humans and as a result they don’t necessarily like the treatment meted out to humans and this has resulted in war. The aliens have split into two factions – Prophus and Genjix – and are engaged in a battle to the bitter end. The Genjix are the stronger force however and have the upper hand – until, at the end of the last book, the fates of both sides were thrown wide open. At the start of book 3 we have again jumped forward. The revelation at the end of book 2 has had dramatic repercussions for both sides – both of them forced to hide their alien nature from the humans who are now aware of their presence and frankly don’t like it! The two sides are still at war – which was a surprise in a way as I wondered if previous events would have pushed them together. Instead of that events seem to have driven the Genjix to step up their own agenda. Roen is now united with his family, Jill and Cameron and between them they help to run part of an underground operation helping other hosts to get to safe places. This is a great series it really is. Aliens, spies, war. Body Snatchers meets Bond. There is plenty of action. It’s easy to become attached to the the Tan family and to care about them and their ups and downs. There’s a great supporting cast and there are plenty of twists and turns and on top of that we finally find out what the ‘big’ plan is that the Genjix have in store for the planet. What I particularly like about this series is it started off by provoking lots of questions. The second book came along and answered my questions whilst delivering a great plot and dramatic finale and then the third managed very successfully to wrap things up – which was great because I really couldn’t second guess how this was going to end. I also really liked the focus on the friendship that some of the hosts and aliens had achieved. It’s a difficult book to review though because I don’t want to give anything away about the end. All I can really say is that I thoroughly enjoyed this series. It started off really well but then continued to grow into a very well thought out and complex drama I found myself going from the question of ‘why would the humans help the aliens’ to ‘why would the aliens help the humans’. A great turn around indeed. Thoroughly good characters, loads of action and all peppered with a wonderful sense of fun. No hesitation at all in recommending. I received a copy courtesy of the publishers through Netgalley for which my thanks. The above is my own opinion. Oh I just finished this yesterday! I adored it, and it’s my favorite book of the series, for sure. I’ll be writing my review sometime this week, I hope. I did think things were a little open-ended at the end, though, didn’t you? I think he’s leaving room for more books, as I heard that Angry Robot has just bought a new series from him set in the same world. Haha,that’s interesting – there’s definitely room for more books and I would certainly continue. I also liked the way this concluded. Your review was much more coherent than mine – I was trying to avoid spoilers and so went a bit to pieces. You managed to get all the right points across without dropping the ball – well done. It was the favourite for sure – I started off with niggles, then they got answered and then we had this. Plus I was really pleased with the way he ended it. It could continue – but I doesn’t have to. Very clever and given the way he jumps forward with each book he could pick it up and jump forward to a different set of people. I loved the friendships as well – particularly I thought it was great that Roen still heard Tao in his head giving him advice. And the whole teenagers on board as well – so good. Ohh, and the betrayal – Nooooooo. You’ve really captured my interest with this series! It was really good. It’s very original. There’s plenty of action and adventure and it’s just fun on top of that. Win win. I am so excited to read this one!! 🙂 I loved the first two and hearing this you say this book is even better than the last. I felt like each one got better to be honest – I went back and checked out Mogsy’s review and she was spot on in pointing out that the writing also became better. It was good to start off with but by the third it was really spot on. Can’t wait to see what you think of it.